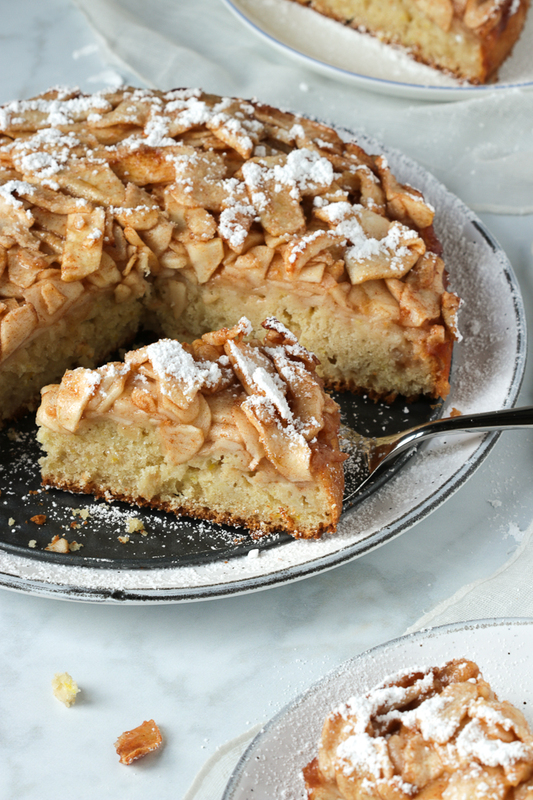 This Rustic Italian Apple Cake is a classic in Italy! Ideal as a tasty anytime snack or dressed up with a scoop of ice-cream for an afternoon delight. This recipe was originally published January 27, 2015 and updated with new photos November 11, 2018. 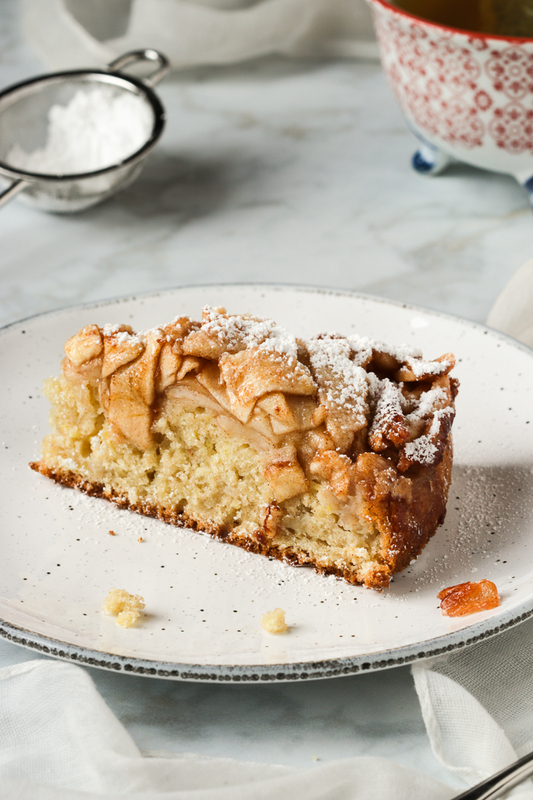 There are many versions of this cake, crowned with layers upon layers of sliced apples. Here, the apples are piled up high in a very rustic way, much as you would when making apple pie. They’re first tossed with some lemon juice and aromatic cinnamon and then sprinkled with a generous amount of demerara sugar for a slight crunch. Tossing the apples with lemon juice and cinnamon is something I learned from Zia’s, Olive Oil Apple Cake. The lemon juice will keep the apples from oxidizing and really lends a lovely tangy taste. And, also a lovely contrast to the sprinkle of demerara crystals. The batter holds up the mound of sliced apples extremely well and for extra moistness I folded in a cup of chopped apples to the batter. It makes a delightfully moist and citrusy bite from the lemon zest and with an added warmth from the scent of vanilla. My crisper drawer just happened to be full of Lobo, Mcintosh and Empire apples so I used a mix of all three. However, you can use any type of apples for this recipe. 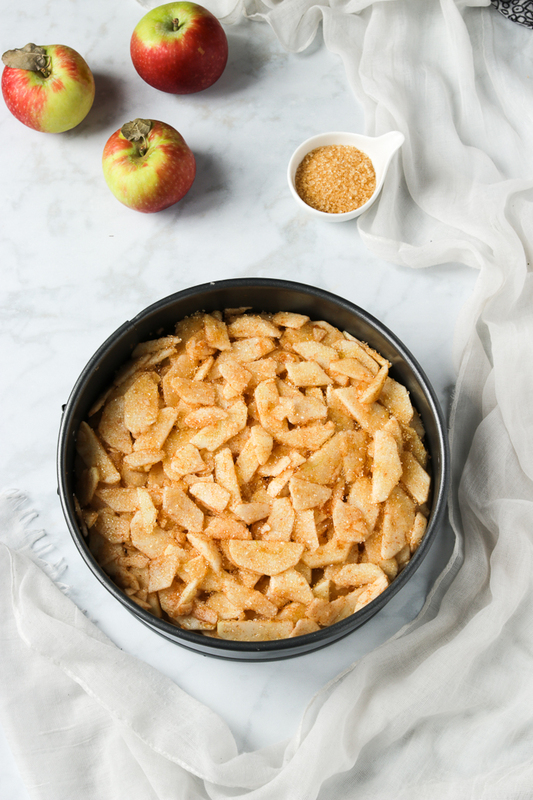 From Royal Gala to Sweet Golden Delicious. These would all work wonderfully! 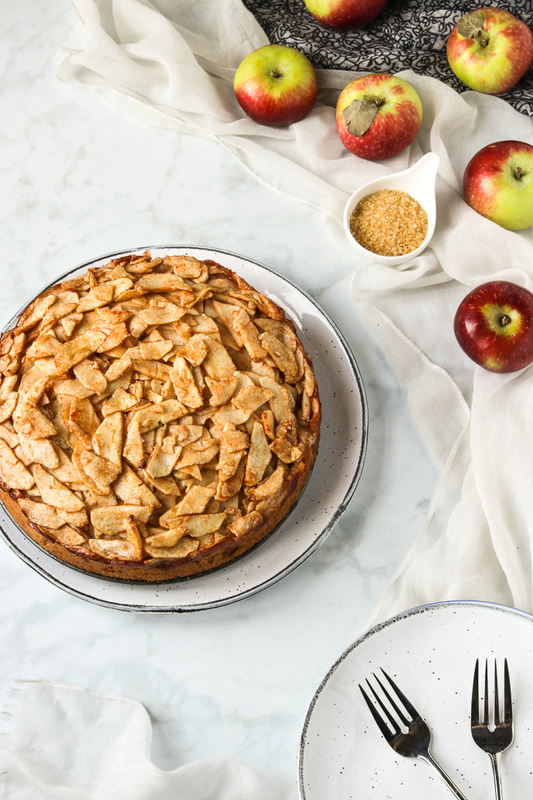 You can serve this apple cake slightly warm or at room temperature. All thats needed is a light dusting of powdered sugar just before serving. Then simply enjoy with your favourite cup of coffee or tea! 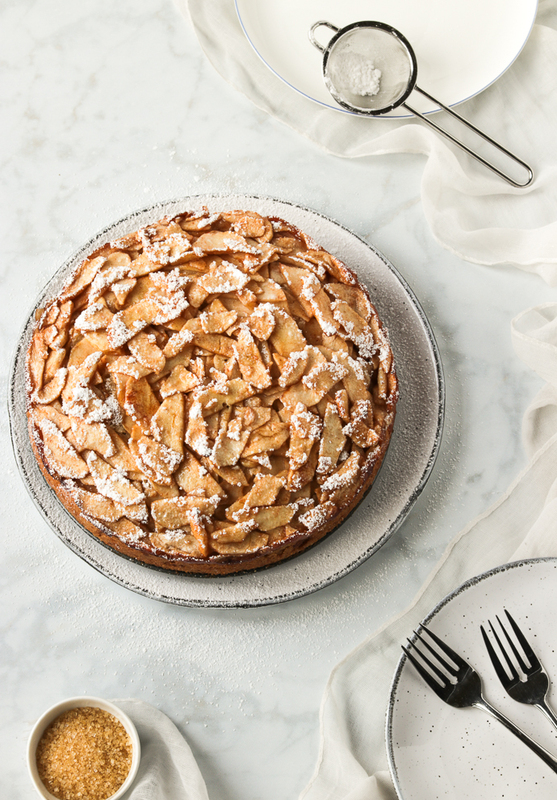 Lemon scented Rustic Italian Apple Cake, crowned with layers upon layers of thinly sliced apples. Makes an ideal afternoon or anytime treat. Grease a 9 inch round springform pan. Peel, core and slice the apples into 1/8 inch thin slices. Toss the sliced apples with the lemon juice and cinnamon. Reserve 1 cup of the sliced apples, chop and set aside. In a large bowl, beat together the softened butter and sugar just until creamy, for about 1 minute. In a separate medium sized bowl, whisk together the flour, baking powder, cinnamon and salt. With the mixer on low, add the flour mixture to the butter mixture alternately with the almond milk making 3 additions of dry and 2 of wet. Fold in the 1 cup of reserved diced apples. Spoon the batter into the prepared pan and level the top with the back of a spoon or an off set spatula. Layer the apple slices over the cake batter in a circular motion while slightly overlapping them. Top with a generous sprinkle of demerara sugar. Bake in preheated oven for about 45 minutes or until a toothpick inserted in the middle comes out clean. Run a knife around the edge and let cool in the pan for bout 15 minutes.